Overview: Support group of volunteers wanting to ensure the smooth running of ITS programmes. This is a pivotal role which contributes to the success of the business therefore careful consideration is taken when selecting all teams. 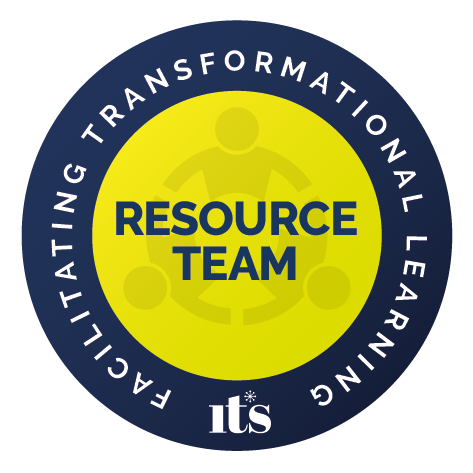 Think back to the programmes you have attended and the helpful people that supported you throughout your journey, do you have what it takes to be a Resource Team member? Logistics: Setting–up the training room before the delegates arrive is so important as this sets the scene for the training and if incorrect can have a huge impact on the atmosphere of the room. There are several roller banners which all require assembly, you will be shown how to do this by the office staff and/or other Resource Team members. You will also be required to be conscious of the room environment to ensure the trainer has all they need to successfully run the day. Temperature must be monitored to set the optimum climate for the room. Front of house: Arguably the most important role of a Resource Team member you will be welcoming all delegates each morning and after lunch, monitoring attendance (this is key for certification purposes as well as Health & Safety procedures). Certification Advisor: This is providing feedback throughout the programmes to all participants. The trainer will be setting exercises and you as a Resource Team member will then be responsible for monitoring these exercises to ensure the participants are progressing in the right direction. You are there to provide positive feedback as well as guidance to ensure they follow the path the trainer has set. Ultimately your feedback and monitoring will help ITS in the decision to award their certification. Customer Service: You are the face of ITS whilst at the training and an ambassador for our trainings. The participants will look to you to answer many questions and not just about the programme itself. On the other hand, you do not have to hold all the answers so please use the office staff as support. Sound: An integral part of the training is ensuring that the trainer(s) can be heard. The equipment is all set up by a trained engineer and you will be given full support in learning the ropes and working the audio element of the training, playing key anchoring music at moments throughout the day and recording the sound (for legal requirements). Product Sales: Some of our training faculty will bring along products for the programmes. These are all sold at our on-site shop. Payments are processed by cash or card and you will be given full training on using this facility. Stock checks will also be required to be taken and the products table must be kept tidy throughout the programme. Hotel Liaison: You will be liaising on ITS’ behalf with the on-site venue events team. This will mean various different things on any given day, the rapport you build with the on-site venue events team will be very important during your resourcing time. Please let us know your name and email address and we will send you an application form. You should then return this to info@itsnlp.com. If you wish to discuss the role or specific opportunities any further, please call us on +44 1268 777125. We would love to hear from you.